To say this bag was minimalist would not do it justice. The logo is exactly the right size, the coloured seal strips are striking. Even the font used to describe the Chips is just right. The full range features an image of each different style of Chip. Simple, but modern. These Potato Chips had a soft and crispy crunch that featured a quick smash before it all turned to pulpy potato. 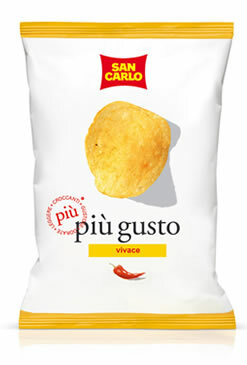 As with most of San Carlo's bags the image on the front of the packet was pretty authentic. There were some red specks here and there (some manufacturers include a way more ambitious texture than is actually included). The Crisps were somewhat bobbly from the frying process. The colour was a sort of golden yellow with oil patches. They felt particularly greasy. A Nose Plunge Test did not suggest there would be any flavour, but there was. They were a mildly salty potato infused with pepper flavour. The colour of the Pepper was red, so we will presume there is a difference between this type of Pepper and the ordinary black Peppercorns that most Crisps manufacturers use. This was laced with a very mild, but tangy Lime. The combination was altogether rather inoffensive and safe, but still enjoyable.